At Davitt Electric, we can help you with all of your electrical wiring needs. Whether you need wire for a single electrical outlet, wiring for a new circuit-breaker box, an electrical appliance connection or entirely new wiring throughout your Bentonville home, we have you covered. There may be times, especially if your house is more than 40 years old, when you need to upgrade electrical wiring for safety, or because the existing wiring no longer meets your family’s power needs. Call us for an electrical inspection to be on the safe side. It is important not just to hire any electrician for your electrical wiring needs. Nothing is more important than a safe home. You can always count on our Bentonville electricians to provide a safe home environment with electricity that works to fit your needs. Some of our services include new construction wiring, wire for remodeling projects, dedicated electrical lines, electrical fixture wiring, appliance wiring, dryer outlet conversions, electrical meter upgrades, backup generator wiring and more. With Davitt Electric you can rest assured that our Bentonville electrical wiring experts are true professioanls who master their craft and stay up-to-date with the current electrical code and requirements. 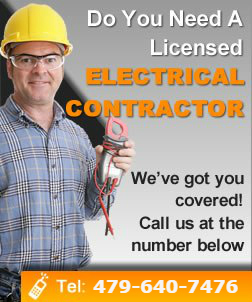 Call today to have your electrical wiring project done efficiently, within budget and up to code.